Berlin-based artist XOOOOX joins the artist-in-residence program of the Arts & Nature Social Club. The Arts & Nature Social Club supports artists in their creative activities by providing them with a retreat at an inspirational ancient farm house in Alsace, close to the city of Baden-Baden. At the farm house, the individual is given the chance to use new materials and the opportunity to explore the latter‘s practice within nature and another community. This year, the Berlin-based artist XOOOOX has demonstrated that a change of location and an intensive occupation with an alternative surrounding helps to restart with new ideas. 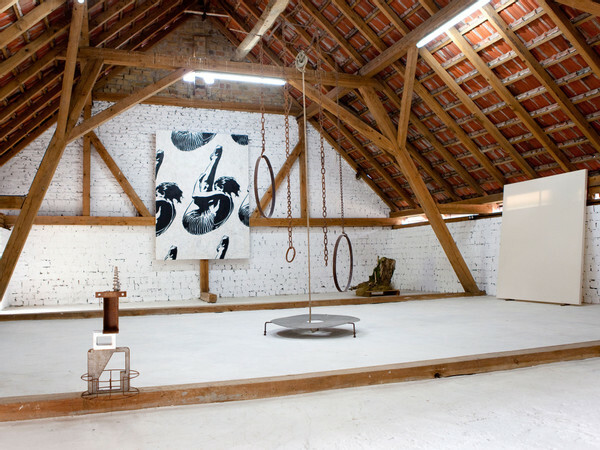 After having spent one month in Alsace, XOOOOX came up with diverse installations, paintings and sculptures. As a source of inspiration, he drew on the barn, that has been untouched over the last 50 years, in which he found a treasure trove of dusty and historical Objets Trouvés. As the culmination of the artist-in-residence program, members of the Arts & Nature Social Club were invited to join the summer reception in the barn and garden of the farm house in early September in order to enjoy the newly created artworks.